AFRICA/NIGERIA - The Bishop of Zaria: "Go and vote according to conscience and do not give in to the temptation to sell your vote"
Abuja (Agenzia Fides) - Nigerian Bishops' appeals have multiplied in order for voters to contribute to ensure that the political and presidential elections of 16 February are regular and not undermined by vote-rigging and vote-buying. After the Bishops of the Ecclesiastical Province of Lagos had warned the faithful about the sale of their vote (see Fides 25/1/2019), His Exc. Mgr. 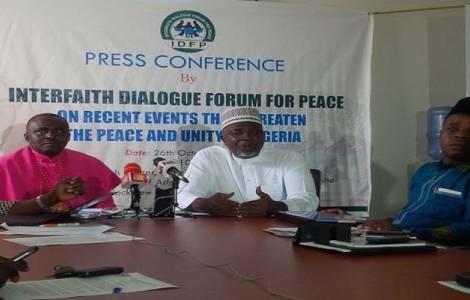 George Jonathan Dodo, Bishop of Zaria (in northern Nigeria) warned politicians not to resort to fraud and incitement to violence to win the elections. During the press conference at the pastoral center in Zaria, Mgr. Dodo said that "as Nigerians, a responsibility of this nature includes acquiring our Permanent Voters Card (PVC), using votes for the good of Nigeria as a whole". "We must say no to vote buying, and voting for candidates who are God fearing and accountable", he added. Mgr. Dodo then urged the people "on February 16 to vote for any candidate of your choice whom you think has good qualities and capacity to defend, improve and, or add value to your lives and dignity".